The Scotland Bill is set to bring major new powers to the Scottish Parliament after the UK Government and Scottish Government reached agreement on the provisions of the Bill, the Secretary of State for Scotland Michael Moore announced today (Wednesday 21 March). The Scottish Secretary today set out in a Written Ministerial Statement to the House of Commons the measures agreed with the Scottish Government on the tax powers, borrowing powers and non-finance elements of the Scotland Bill. * The UK and Scottish Governments have the intention of reaching agreement on all implementation issues. * Borrowing limits will be reviewed regularly ahead of Spending Reviews. 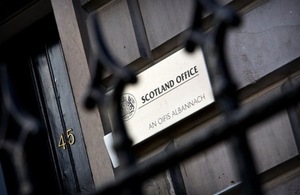 * The Government will shortly launch a consultation on the Scottish Government being able to issue its own bonds. * A certification requirement will not be introduced on appeals to the UK Supreme Court from Scottish criminal cases but there will be a review of the new arrangements after three years of operation. The Scottish Government will today table a Legislative Consent Memorandum which recommends the Scottish Parliament votes in support of the Bill when the Legislative Consent Motion is put before Holyrood. The Scottish Secretary has always said he wanted the Scottish Parliament to give their support for the largest ever transfer of powers from London to Holyrood. This will bring a much higher level of financial accountability to Holyrood as MSPs become responsible for raising more of the money they spend. “Today marks a major step forward for devolution and I am glad Scotland’s two governments have reached agreement over the Scotland Bill. The UK Government has been clear from the outset we believe it is the right package of new powers for Scotland. We have also been clear that we wanted the Scottish Parliament to support the measures contained in the Scotland Bill. It will strengthen devolution and the cross-government support for the Bill is good news for Scotland. The Secretary of State for Scotland (Michael Moore): The Scotland Bill is a significant step forward in Scottish devolution. It provides for the biggest transfer of fiscal power from London since the creation of the United Kingdom - including a new Scottish rate of income tax, full devolution of stamp duty land tax and landfill tax, and new borrowing powers. Together, the OBR forecast that these measures will enable the Scottish Government to raise between £5bn and £6bn of its budget in addition to around £4bn it currently raises in council tax and non-domestic rates. Since its introduction in November 2010, the Bill has had detailed scrutiny in the UK and Scottish Parliaments. In Westminster, it has passed successfully through its Commons stages and will soon complete Lords Committee consideration. In Holyrood, the Scottish Parliament voted overwhelmingly in support of the Bill last March. After productive discussions with the Scottish Government in recent weeks, the Government is today announcing a package of measures in the Bill and supporting non-legislative arrangements to show that the powers will operate in a fair and sustainable way to the benefit of Scotland and the rest of the UK. Agreement has been reached with the Scottish Government on both the finance and non-finance provisions included in the Bill and the Scottish Government will today table a Legislative Consent Memorandum recommending that the Scottish Parliament votes in support of the Bill on a further Legislative Consent Motion for the Bill. * The Government will ensure that changes in the Scottish Government¿s budget are closely linked to the performance of its economy by adjusting Scotland¿s budget to reflect new tax powers using the model recommended to the Welsh Assembly in the Holtham Report. This approach, agreed with the Scottish Finance Minister and the Chief Secretary to the Treasury, will help protect the Scottish Government¿s budget from wider macro-economic shocks. * The Government will work together with the Scottish Government over coming months and years to give operational effect to the powers including the block grant adjustment, in a fair and sustainable way with the intention of reaching agreement on all implementation issues. * The Scotland Bill will be amended to require the Secretary of State for Scotland and Scottish Ministers to produce annual reports to the UK and Scottish Parliaments on the progress of transferring the tax and borrowing powers to the Scottish Government. * In line with long-standing principles of devolved funding, the Scottish Government will pay for its new income tax system of administration. The Government will explore the scope to offset some of the savings from HMRC ceasing its administration of stamp duty land tax and landfill tax. * Borrowing limits will be reviewed regularly ahead of Spending Reviews through the Joint Exchequer Committee. * The Scottish Government will be given access to loans over a longer period in principle, subject to the ability to repay and the type of asset. * The Government will shortly launch a consultation on the Scottish Government issuing its own bonds. * Aggregates Levy will be devolved once the legal challenges in the European and UK courts have been fully resolved. * The Government is open to considering what further powers might be devolved after a referendum on independence. * The clauses reserving the regulation of health professions and insolvency will be removed, following assurances from the Scottish Government that they will work closely with the Government to ensure consistent regulatory regimes apply to health professions and that insolvency procedures are kept up to date and operate effectively throughout the UK. * The clause allowing partial referral of Acts of the Scottish Parliament to the Supreme Court will be removed at the request of the Scottish Government. This means in the future - as at present - a full Act could be referred to the Supreme Court, even if only a single provision raised competence issues. * The clause on implementing international obligations will be removed following assurances from the Scottish Government that they will work closely with the Government to ensure that the UK continues at all times to implement its international obligations. If there is a failure to implement any international obligation the UK Government may use its powers under s.58 (2) of the Scotland Act to direct Scottish Ministers. * Additional amendments will be made to the provisions on appeals to the Supreme Court from Scottish criminal cases. A certification requirement will not be introduced. However, the new arrangements will be subject to a review, chaired by the Lord Justice General of Scotland, after three years of operation. Certification will be included within the scope of the review, and it will be possible for changes to be made to the arrangements by subordinate legislation following the review. These announcements today meet the tests the Government has set for changes to the Bill package - they are based on evidence, maintain the cross-party consensus which supports the Bill, and will benefit Scotland without detriment to the rest of the UK. The Scotland Bill was introduced in November 2010 and has had detailed scrutiny in the UK and Scottish Parliaments. At Westminster it has passed successfully through its Commons stages and will soon complete Lords Committee consideration. At Holyrood, the Scottish Parliament voted overwhelmingly in support of the Bill last March. It was also the subject of scrutiny by the Scottish Parliament Scotland Bill Committee.